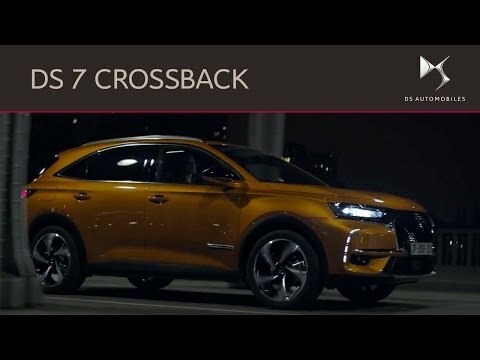 The DS 7 CROSSBACK: The SUV done right. Charismatic, characterful and attractive, the DS 7 CROSSBACK perfectly captures the vibrant, charming French spirit of DS Automobiles. The highly polished DS 7 CROSSBACK finds innovation at every opportunity, to present you with a driving experience that is truly unprecedented. And truly irresistible. ​Experience refinement like no other with the DS 7 CROSSBACK. Choose between the new THP 225hp Stop & Start 1.6-litre petrol engine or the BlueHDi 180hp 2.0-litre diesel engine. Each are mated to the shiny new eight-speed automatic gearbox which provides rapid, imperceptible changes so that you and your passengers will be in for a smooth ride. The DS 7 CROSSBACK is not just a car, it’s your new co-driver. DS Connected Pilot employs ACC Stop & Go to maintain a safe distance from cars in front, while Lane Position Assist will ensure that you stay securely in your lane at all times. With the DS 7 CROSSBACK, you’ll always arrive at your destination cool, calm and collected. See the traditional SUV with fresh eyes. The captivating DS 7 CROSSBACK offers impeccable style that is hard to imitate; it’s an SUV with a difference. The front vertical grille is complete with DS Automobiles’ distinctive DS wings motif which blends faultlessly with the beautiful exterior, while its muscular body ensures that all eyes are always on you. ​You can tailor your DS 7 CROSSBACK to suit you, with four exquisite interior designs available to choose from. Expert craftsmanship combined with high quality materials make for an interior that exhibits sheer refinement and luxury. Materials such as real wood, Alcantara and Nappa leathers are used to create a chic, contemporary interior that is inspired by high Parisienne fashion. The interior of the DS 7 CROSSBACK is designed to give you the very best driving experience. Two 12” screens ensure that you and your DS 7 CROSSBACK are always in sync: the centrally mounted touch screen gives you access to HD navigation, multimedia, Mirror Screen and DS Connect; the second screen is located on the instrument panel to give you all the information you need directly in your field of vision. Of course no journey is worth making without your favourite tunes played in incredible quality. DS and Focal have teamed up to ensure only the purest of acoustics are played in the DS 7 CROSSBACK. Everything about the DS 7 CROSSBACK will take your driving well into the 21st century. With plenty of innovative features, your driving will be more advanced and safer than ever. Let your DS 7 CROSSBACK quite literally guide your way with DS Night Vision. Utilising infrared technology, this feature will show you what’s ahead in the dark, highlighting vulnerable road users. In addition to this, the innovative DS Active Scan Suspension will help you to avoid potholes, lumps or imperfections in the surface of the road ahead. The suspension will adjust instantly for maximum comfort, creating the driving experience you deserve. ​The DS7 Crossback is the largest car in the French manufacturer’s line-up. It’s been designed with style as a priority, but has it got substance to back the looks? The DS7 Crossback is another entry into the constantly expanding SUV market – but it’s one designed to stand out from the crowd a little more than your conventional offering. It’s based on the same platform successful and well-made Peugeot 3008, but whereas the Pug is all about practicality, the DS leans more on the stylised side of things. It’s why you’ll find styling touches both inside and out that rarely feature on road cars. Of course, it’s backed up by economical engines and decent interior space, too – but we’ll come to that later. As we mentioned, the DS7 is based on the Peugeot 3008 platform, and that means it’s utilising a solid basis. The new elements here are aesthetic. It means the cabin is trimmed, in our Performance Line specification car at least, in swathes of alcantara, while the main cabin buttons are chromed and given a milled-effect. The graphics on the main displays have been heavily stylized, too.The DS7 Crossback also benefits from a raft of safety assistance systems. These include DS Active Scan suspension, which uses cameras to monitor the area ahead and adjust the suspension accordingly to provide a pillowy soft ride – though only when comfort driving mode is selected. Our test car, in Performance Line trim, was powered by a 2.0-litre turbocharged diesel engine, sending 178bhp and 400Nm of torque through an eight-speed automatic gearbox to the front wheels. Performance is decent enough, with the sprint to 60mph taking 9.6 seconds before reaching a top speed of 134mph. Economy is the most impressive though – DS claims 57.6mpg on the combined cycle, with emissions of 128g/km CO2. That eight-speed ‘box isn’t bad in daily use; it’ll happily slush through the cogs at slower speeds, but can feel a little jolting when you’re pushing on, sometimes shunting between the gears when accelerating hard. There’s also the option of a lower-powered 128bhp diesel, or a high-output 221bhp petrol – with emissions and economy the best in that less powerful unit. The DS7 Crossback has been geared towards comfort, rather than a sporty drive. Even this Performance Line specification car, riding on large 19-inch alloy wheels feels on the softer side of things. The steering is relatively light at low speeds and weights up nicely as you speed up, while the ride manages to soften off the vast majority of imperfections in the road surface. There’s quite a lot of lean through the corners, but this is a by-product of that softer ride. The biggest annoyance is the lane keep assistance system. It’s overly keen to alert you, and is particularly irritating on country roads. Very quickly you learn to disable it as soon as you get in the car – and this really isn’t the point. We’ve got to applaud DS for the styling on the Crossback – it really looks like little else on the road today. Many passers-by enquired as to just ‘what’ it was, with many mistaking it for cars from far more premium manufacturers. The large front grille and distinctive daytime running lights really do give it a lot of visual impact, while the criss-cross LED rear lights which strobe when indicating are another highlight. It certainly suits larger wheels as smaller ones can appear a little lost in the larger arches. It’s a design which will divide opinion, but that’s what some people want from their cars. At the very least, it manages to be different among many other rivals of a similar size and shape. Step into the DS7 Crossback’s interior for the first time and you’re met with all manner of angles, materials and screens. It’s an impressive cabin from the off, and feels exciting in terms of design. Will it date over time? Almost certainly. But right here, right now, it looks very good. The switches by the gear selector have a decent action to them and, despite the presence of a few harsher plastics on the door handle surrounds and bins, it all feels well screwed together. The alcantara used on the majority of surfaces on our test car looked good, but was susceptible to picking up a lot of dust and crumbs – something worth bearing in mind if you’re looking for family transport which won’t look down-at-heel after just one trip. The DS7 Crossback comes with a lot of equipment as standard, with highlights including a 12-inch colour touchscreen infotainment system – which operates well and houses functions such as satellite navigation and media controls – along with an eight-speaker sound system and an impressively large air conditioned central storage area, which is large enough for a two-litre bottle of water. There’s one drawback – the price. As standard, the DS7 Crossback in Performance Line trim starts at £36,335 – though our test car, with options such as metallic paint, came in at a hefty £38,285. Prices for the top-spec Ultra Prestige trim start at £43,185 – which is just too much for a car in this segment. This is particularly apparent when you consider that you could get a top-spec 3008 for £34,210. The DS7 Crossback really is a genuinely good-looking offering in the SUV segment. It’s classily designed, has plenty of exciting touches and is solidly built for the most part. It’s just tricky to put that price out of your mind – it’s an exceptional amount of money for a car in this area, and feels just a little too much when you take into consideration the standard equipment and overall driving experience. If this was just a little cheaper, then it would be really competitive – but at this price, it’s a tough one to recommend. Terms and Conditions: Finance offers apply to qualifying new vehicles ordered and delivered between 01/04-30/06/19. Offers available to qualifying retail customers excluding Free2Move Lease. 3 years’ 0% APR Conditional Sale with 10% minimum deposit available on DS 3 models. 4 years’ 0% APR Conditional Sale with minimum 20% deposit available on DS 3. 3 years’ Low Cost Elect 3 3.9% APR available on DS 3 models. 3 years’ Low Cost Elect 3 4.9% APR available DS 3 CROSSBACK and DS 7 CROSSBACK models. Finance offers apply to UK Mainland only. All DS Elect 3 products quoted with compulsory DS Assistance. Terms and conditions apply. Finance subject to status. Guarantees may be required. Over 18s only. Elect 3 examples based on 10,000 miles per annum. Excess mileage charges will apply if you exceed the agreed annual mileage. Written quotations available on request from PSA Finance UK Ltd, RH1 1QA. Citroën U.K. Limited (trading as DS Automobiles) is acting as a credit broker and is not a lender.